This article was produced as a project for the USC Annenberg Center for Health Journalism’s 2018 California Fellowship. 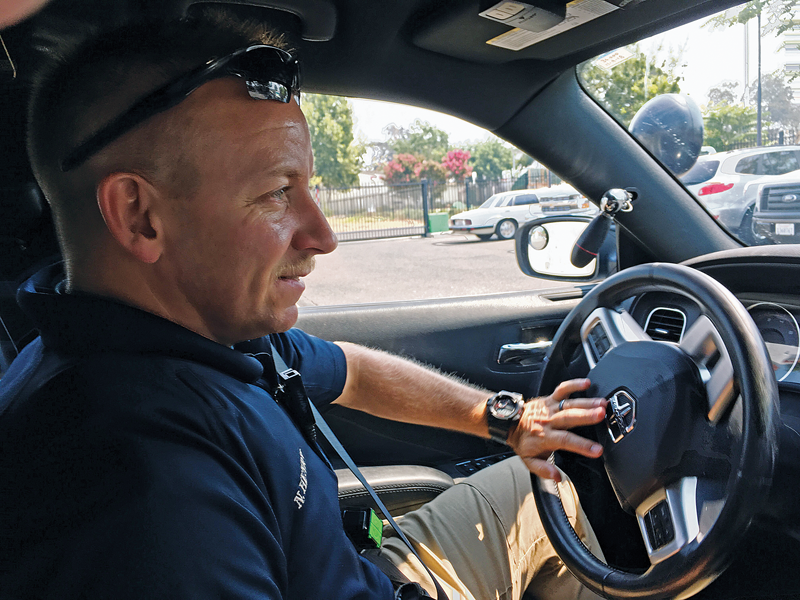 This is the second article in a three part series that will publish in successive weeks reporting on the state of mental health training for law enforcement in Tulare County. VISALIA – California does not mandate mental health training for officers, but it does require cadets receive Crisis Intervention Training (CIT) before graduating from the police academy. The Tulare police officers involved in the Jontell Reedom shooting had received CIT, but it is unknown if they elected to continue CIT courses offered in Tulare County. Jack Amaroso, COS Director of Public Safety Training, said he has been with the COS police academy since 1986 and there has always been some component of CIT in the curriculum. 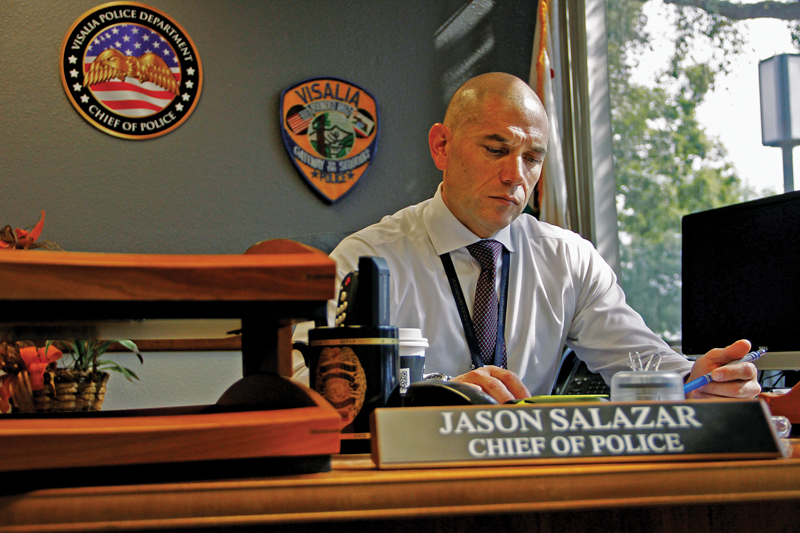 Visalia Police Chief Jason Salazar went through the academy in 1996 and said the finer points of CIT were taught after graduating during his field training. Now CIT has become an explicit part of academy curriculum. But that does not necessarily mean cadets are being trained to deal specifically with mental health. Thirteen year VPD veteran and HOPE team officer Nate Henry patrols north Visalia near the Oval where large groups of Visalia’s homeless gather. Photo by Paul Myers. According to Amaroso, cadets in the academy take a 15-hour CIT class in the last course within the academy. The class teaches cadets how to deal with people who have physical and psychological disabilities. And while many disabilities are accounted for Amaroso could not say how much of the curriculum is specifically dedicated to mental illness. Aside from class work, two hours of the 15-hour course offers multiple role-playing scenarios where every cadet gets the opportunity to observe and participate. And part of the point of every scenario is to practice de-escalation with the purpose of opening communication. “You’ll have to open up lines of communication with these folks or it escalates. We want to make things better when we show up…we need to lower the emotional threshold so we can actually communicate,” Amaroso explained. Specifically cadets engage in simulations where they need to communicate with someone who is autistic. Amaroso says it is important for officers to understand how lights, sirens and aggressive action can make it difficult for a person with autism to understand an officer’s commands. Cadets also participate in scenarios that deal with suicidal subjects involving a firearm or perhaps a knife. The scenario calls for officers to use their de-escalation tactics to create communication and resolve the situation without harm. Amaroso added that de-escalation is important in other ways. He says by calming a tense situation the officers are also protecting themselves from a potentially violent outburst. While the time spent in class and the two hours simulating scenarios helps officers prepare for potential crises they will face in the field, the lack of time dedicated to understanding mental illness can leave many officers unprepared. Officers can theoretically go their entire career after the academy and never take a second CIT course. California does not require it and it is not viewed as a perishable skill in need of renewal. But the need for more mental health training for current officers is undeniable. The partnership in Tulare County between the two largest law enforcement agencies and the mental health branch began in 2008. The entire curriculum spans 40 hours over four days. “It is our opportunity to come together for mental health with law enforcement individuals and kind of introduce them to world of mental health and those dealing with mental health issues and help them understand the barriers and issues that those with mental health are dealing with,” said Casie Ennis, Psychiatric Emergency Services manager for Tulare County Mental Health branch. While the Tulare County Mental Health branch ultimately hosts the training, the content is a collaborative effort between them and the law enforcement agencies. Course material integrates presentations from experts, officer safety and tactics and then four role play scenarios. In their first day of training officers listen to presentations providing an overview of the mental health system, personality disorders, psychosis disorders, psychotic disorders, dementia, and neurocognitive disorders. Their second day introduces mood and anxiety disorders, a presentation by family members of those struggling with mental illness or a panel of presenters who have struggled with mental illness and then bring presenters who have benefited from mental health services. In addition officers are exposed to presentations for autism, developmental disabilities and visit the Kaweah Delta Mental Health Hospital. Officers’ third day is consumed by officer safety and tactics training. The fourth day for officers is their chance to practice the tactics they have learned through four simulations: suicidal person on the Santa Fe Rail Road overpass above Highway 198; a suicidal person with a knife to their throat; a person with a personality disorder who is angry and unwilling to openly communicate; and a person who has removed their clothes in a park, non-combative, talking to themselves, easily distracted and disturbing the peace. Salazar and Ennis say the feedback from the officers that attended has been positive, in part because the curriculum is influenced by their fellow officers. “It has been presented in a way that makes sense to them so you know the buy in is real.” Ennis said. The course is free for officers and offered twice a year. Right now the training can only accommodate between 35 and 40 officers per course, and Ennis says they will be offering the course four times per year beginning in 2019 to help meet the growing demand. The course has been available for 10 years, offering two courses per year until mental health started drawing more attention because of law enforcement. In addition to help create the curriculum for CIT the Visalia Police Department has taken it upon themselves to help the most public portion of the mentally ill, with their Homeless Outreach & Proactive Enforcement (HOPE) team. Chief Salazar admits there is not an exact one-to-one correlation when it comes to homelessness and the mentally ill. But he noted that calls for his department regarding homelessness have gone up 900 percent between 2007 and 2017. Most of those calls were either related to a mental illness or severe substance abuse. “Mental health has become a much bigger issue than it was years ago. We are seeing it a lot more. Some of it is diagnosed and sometimes it is substance abuse so those things cross lines a lot, and they both have the same kind of impact,” Salazar said. For Visalia’s Chief of Police the correlation was strong enough to establish the HOPE team in 2017. The team began with two full-time officers and then expanded to four when they proved to be effective at helping the mentally ill of the homeless population in Visalia. In just one year the HOPE team has been considered a success. Officers on the team have helped those who are struggling with mental illness, and living on the street, by referring them to the Projects for Assistance in transition from Homelessness (PATH) program and providing assistance to those who are chronically homeless through Kings View Corporation. They also help the homeless through jobs programs, shelter referrals, and even spiritual referrals with the Visalia Rescue Mission. “I think our HOPE team is a big tool, because they become more and more familiar with people and more and more familiar with the resources,” Salazar said. Officer Nate Henry has been a part of the HOPE team since it was established, and is a VPD veteran of 13 years. He had taken CIT three years before signing up for transient detail for the north of Visalia in January 2016, before HOPE was created. He continued the assignment every other quarter, taking three months off to give other officers the opportunity. When VPD created the HOPE team they pulled Henry in for an interview. “They mostly went over ideas on how to help the homeless and what they could do to see if you’re invested in this or if it’s just another part of your job,” Officer Henry said. According to Henry, having a familiarity with the population is key to understanding them. He said that he is acquainted with over 100 people who live on the street and those tend to be the people they are called out for most often. Now that he has spent over a year as a HOPE team officer Henry has come across any number of situations dealing with mental illness. And familiarity is not the only helpful tool, sometimes it is just good judgment. Henry said part of being a HOPE officer is knowing how to “read the need” of the people he is approaching. “If it was more of a substance abuse thing then I’ll try and approach that by getting them into some program if they are willing…if it’s mental illness, I’ll offer to take them to mental health services and sit with them in the waiting room if they want me to,” Henry said. He noted the way an officer physically approaches the homeless is just as important as what they have to say or offer. Henry said that he will sometimes ride his bike around the places where the homeless tend to stay instead of driving his car because it is less intimidating. Having a HOPE team for Visalia is a significant help to other officers. Part of the reason it was created was to free up the time patrol officers were spending on non-crime related calls. “Because of the nature of mental illness calls, to identify them, and de-escalate them, and get the right resources together, it takes time and therefore it has a big impact on resources,” Salazar said. Officer Henry says that patrol officers will call him when they are called out to a situation that involves a homeless person who is acting erratic. Henry said that the HOPE team would rather take those calls so the patrol officer can return to his assignment and Henry can better remedy the situation because he knows the person. The response to mental illness from the County and the Visalia PD should only become more robust. An Outreach and Engagement therapist or case manager will be doing ride-alongs with the HOPE team and PET will be responding and coordinating care for any individuals encountered that may be in psychiatric crisis. It is a continuation of the motivation to solve problems for the long term in Visalia. “You can’t just sit in an office and wait for them to come to you. You’ve got to go out and find them and get them help where they’re at,” Salazar said. This article was updated on Sept. 22 at 12:36 p.m.